Two Years Later, BP Spill Reminders Litter Gulf Coast It's been two years since the Deepwater Horizon exploded in the Gulf of Mexico, killing 11 rig workers and unleashing the worst oil spill in U.S. history. The oil has long stopped flowing and BP has spent billions of dollars cleaning up beaches and waterways — but the disaster isn't necessarily over. 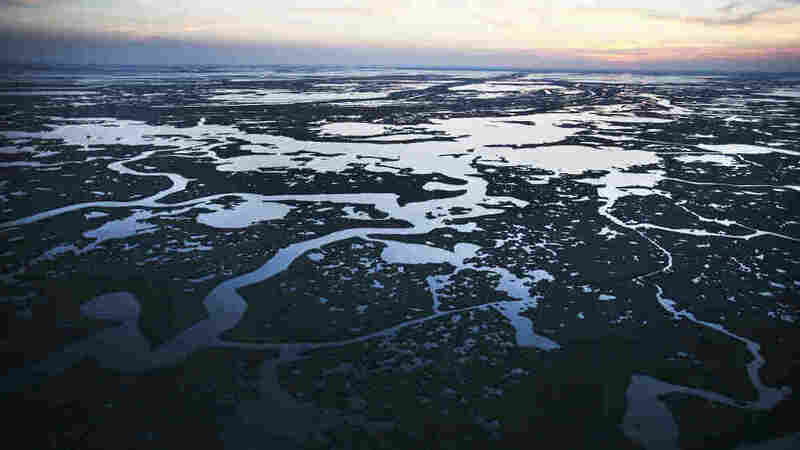 NPR's Debbie Elliott explores the impact of the Gulf oil spill. It's been two years since the Deepwater Horizon exploded in the Gulf of Mexico, killing 11 rig workers and unleashing the worst oil spill in U.S. history. The oil has long stopped flowing and BP spent billions of dollars to clean up oiled beaches and waterways, but the disaster isn't necessarily over. Oil fouled some 1,100 miles of Gulf Coast shoreline, but today, in most spots, you can't see obvious signs of the spill. In Orange Beach, Ala., the clear emerald waters of the Gulf roll onto sugar-white sand beaches. "We have a nice, clean beach now — night and day from two years ago," says Phillip West, the city's environmental manager. West battled the globs of orangey-brown crude that washed ashore after the spill. 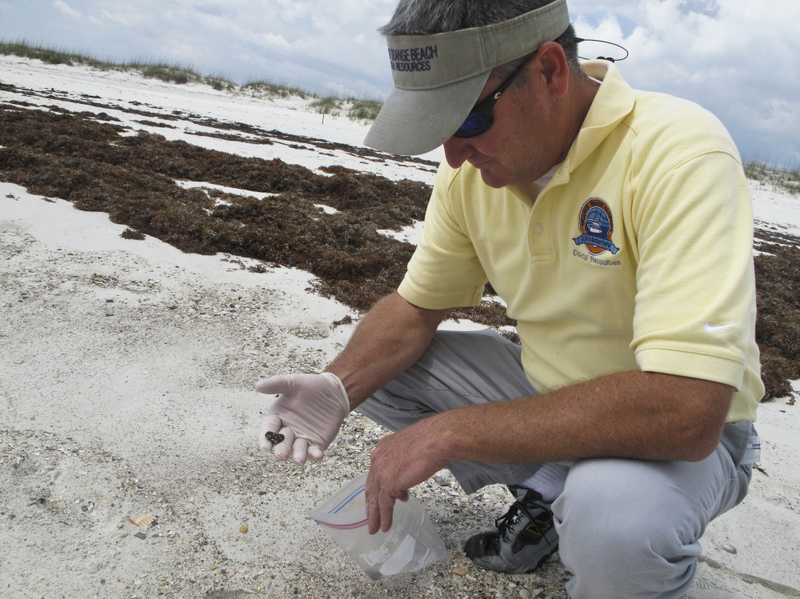 Orange Beach, Ala., Environmental Manager Phillip West holds a tar ball that has washed onto the area's sugar-white sand beaches. He says the clumps of weathered oil come in when the surf is rough — an indication that two years later, there's still oil lingering offshore. "One of the great things that I can say about the beach now is we got our squeak back," West says, referring to the sound the sand makes when it's underfoot. He says that sound means the sand is clean. "It doesn't have that WD-40 feel to it like we had during the spill." But as he squeaks along in the sand, West finds a lingering problem: several quarter-sized clumps of weathered oil. BP crews still scour the beaches here daily but, according to West, there tends to be a spike in tar balls like this after a storm moves through, churning up the surf. He says that means there's likely a source somewhere nearby. "About the only source that could be would be a submerged tar mat," he says, "so that still concerns us a little bit." What's out of sight, isn't necessarily out of mind. West compares the oil spill to a cancer: "Maybe we're in remission. ... We just have to watch it constantly from now on." Scientists are also watching. Scores of public and private research projects are under way to determine the impact of the spill, including the federally mandated Natural Resources Damage Assessment, which will help determine how much BP should pay for polluting the Gulf. Early findings indicate damage to deepwater coral reefs, mangroves, dolphins and some fish species. Scientists warn that showing cause and effect in a large ecosystem like the Gulf of Mexico is a challenge — one that's exacerbated by the lack of baseline data on the state of the Gulf pre-spill. Still, the problems don't appear to be as severe as some initially predicted when the disaster was unfolding. George Crozier is the former director of the Dauphin Island Sea Lab, south of Mobile, Ala. He says that when the spill first happened, he was "panic-stricken." Two years later, he's less concerned. "I don't see this changing the ecosystem of the north-central Gulf," he says. "I don't see it tipping something into catastrophe." Crozier says the acute impacts on the Gulf don't appear widespread, but it will take decades to understand the chronic problems the spill created — problems that are dealing a severe blow to an already fragile coast in south Louisiana. Captain Dave Marino from Myrtle Grove, La., navigates a center console bay boat through the Barataria Basin — a collection of canals, bays and bayous south of New Orleans, on the west side of the Mississippi River. "It's real deep through here and the tide comes in and out real, real strong here and that's ... why the area that was affected by the oil got the oil, because it pulled it through like a funnel almost," Marino says. This region suffered some of the heaviest oil contamination, accumulating in what's known as Bay Jimmy. On a tiny marsh island in the bay, David Muth of the National Wildlife Federation points to how the oil has persisted in the environment. "You can actually see oil seeping out right here — just coming out of the peat — thick, liquid oil two years later," Muth says. There are also pools of water with fresh oil sheen on top, large tar balls and, on the edge of the marsh, dead sections now covered with hardened oil. "That's where there was a layer of oil that is weathered now and it's just a thick layer of tar that prevents the grass from growing up through it," Muth says. The hardened oil is called asphaltene, "and if you smell it, that's what it smells like — it smells like fresh asphalt." Two years later, this Bay Jimmy island is part of 200 miles of Louisiana shoreline still fouled by the BP oil spill. 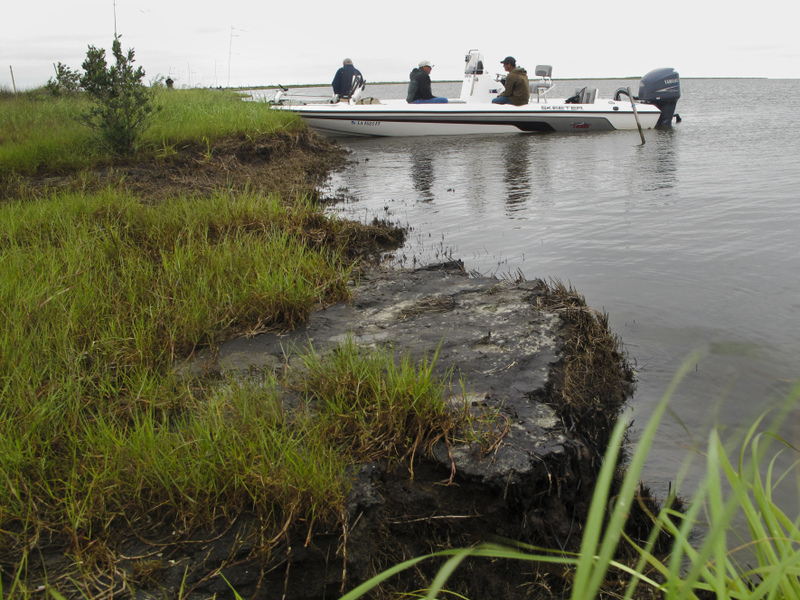 A layer of oil has hardened along the coast, creating a thick layer of asphalt-like tar that's choking the edge of the marsh and accelerating an already alarming rate of coastal erosion. The question, Muth says, is can the Gulf ecosystem recover after absorbing some 200 million gallons of oil? "The deep concern is not so much about this, which is so visible, but this is an indication that the stuff stays in the system," he says. "There's no magic bullet for an oil spill. Once you spill oil, you have spilled oil and there's no putting it back." The Gulf spill took its hardest toll on a system already in decline. Louisiana loses the equivalent of a football field of land every 15 minutes and the oil, still fouling 200 miles offshore, has accelerated erosion in places like Bay Jimmy. Marino has watched it happen. "You can see it's falling apart," he says. "Just right here where the boats parked last year was land. All of it's getting eaten up because the vegetation's dead." Fishermen here want Congress to approve a plan to steer BP's fines into Gulf restoration projects, like diverting Mississippi River water and sediments to rebuild marsh. Ryan Lambert has been a Cajun fishing and hunting guide for 31 years and is alarmed by the decline he's seen in the last two. "This [Bay Jimmy] island should be covered with shorebirds and there are none," he says. "They ought to be nesting in here. Any island before this oil spill, you come up to an island like this and you can't hear yourself think. And look, it's void of life." Lambert says his speckled trout catch is also down 98 percent. "You know, we're used to going out ... where this water is coming through and [picking] up 40 fish right there, no problem in a half hour," he says. "You go try to catch a fish there right now, that's not happening." Lambert says he's tired of hearing "Everything's fine, come on down," a message in some of BP's ads. "Our whole life is upside-down, on hold, waiting to see what happens." He says two years later, it's not fine — and it's far from over.